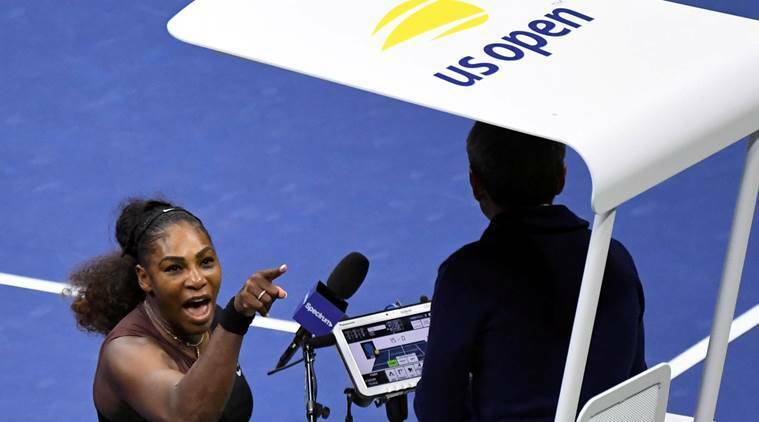 Serena Williams controversy: Umpire Carlos Ramos followed rules but failed to maintain decorum in the US Open women’s final, says Vijay Amritraj. Serena Williams yells at chair umpire Carlos Ramos in the women’s final against Naomi Osaka of Japan on day thirteen of the 2018 US Open tennis tournament at USTA Billie Jean King National Tennis Center in New York on September 8, 2018. Carlos Ramos is a professional. He’s been there for a long time. He’s umpired at all Grand Slam finals. He’s not a rookie and he’s also known to be a stickler for rules. But there are a lot of umpires who are lax. It’s no different from a cop on the road, sometimes you get a ticket, sometimes you don’t for the same offence. But his job is to maintain a balance in the final, knowing it’s a final. If in fact there was coaching involved, he should have told Serena Williams right away ‘you better watch it, this guy (coach Patrick Mouratoglou) is giving you hand signals. You better watch it or I’m going to have him ejected.’ It’s been done before. An umpire calls a player and tells him ‘you’ve been taking too long on the clock,’ or ‘your coach is giving you signals, I’m going to give you a warning next time.’ And not just drop the axe and give the warning the first time. Was Carlos Ramos wrong? He was not wrong. And this was not a gender thing either. He didn’t see her and then dock a game. But in light of the circumstances, he could have clearly handled it in a different way. He could have given her a soft warning during the break as she was changing ends. This is what he should have done. And if he (Mouratoglou) persisted, then the umpire could have given the warning. In my opinion, (Ramos) didn’t go with that discretion. I was surprised that a professional of his calibre, he didn’t do that. If he did, it would have certainly calmed the situation. The second incident, smashing the racquet, it was already too late. Smashing the racquet always gets you a warning. But it should have been the first warning, not the second one. By the time it got past that stage, it got too late. He didn’t control that situation. It’s his job to maintain decorum on the court — it’s an unwritten law. Sure, he did go by the rules. But in this kind of situation, he is also expected to maintain some sense of decorum, considering the final and all that. He could have told the player ahead of time that this was going on and to watch it. He could have used his discretion. This has happened when players have taken too much time between points. You get 25 seconds, Rafael Nadal has taken 45 seconds, has been docked a point before, but he’s been docked after being warned. 99 percent of the time it’s a soft warning the first time. Be it time penalty, interactions with the crowd, coaching is a common factor. So there are lots of areas where there can be a warning. New York was out of control with the heat this time. If the umpire is smart, he’ll allow five more seconds for towelling off, because it’s hotter and there’s more sweat. That’s the discretion of the umpire which is allowed. You’ve got to use that discretion, the umpires are allowed it. But you have to maintain decorum. hats off to the girl (Naomi Osaka) at the other end of the spectrum, who was the star of the whole event. She was the better player on the day. A soft warning is the simplest of warnings. It didn’t happen here, which in my opinion is what escalated the issue in the first place.